Acted in the YEARE, MDCXXXII. By the Queenes Majesties Servants. LONDON, Printed by RICHARD OULTON, for CHARLES GREENE; and are to be sold at the Signe of the White Lyon, in PAULS Church-yard. 1638. 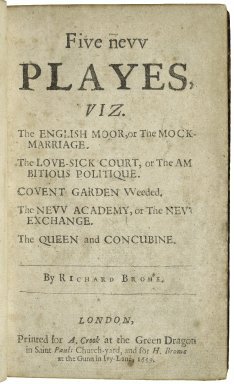 Title page imaged from Folger call number: STC 14754 copy 4 pt.1. Image is not from the transcribed copy.